Map scale description: 3 3 /4'' : 1 m.
This map was issued as a free supplement in the 'United Kingdom' newspaper. Surrounded by a decorative border, the map's title appears in a panel above the plan, with the Royal arms and arms of the Cities of London and Westminster. 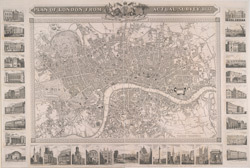 Inset within the border are illustrations of prominent buildings and landmarks, including the Bank of England, Lambeth Palace, Covent Garden and Waterloo Bridge. The map shows the intended tunnel under the Thames linking Wapping and Rotherhithe, the first underwater tunnel in the world when it opened in 1843.